It's delightful to be here with mew again and I can safely say this week there have been no mishaps thus far, but that could be due to the fact that we got the P.A. a bubble-wrap suit which our pawesome pals at www.15andmeowing.com suggested. "Mew're a total liability and it's fur your own well being!" Anyhoo it's that time again, so let's get on with the show. The Cat Who Series is one of my all time favs effur and this novel is the furry furst one in the series written in 1966. It tells the tale of crime reporter Jim Qwilleran who is attempting to get his life back in order by accepting a job with his old pal at a new Newspaper, The Flux. But instead of reporting crime, his new gig is on the art-scene and his days are spent purrusing galleries and exhibitions. Howeffur it's not long until there's a murder and he's smack in the middle of it. Enter Koko the incredibly intelligent Siamese, who Qwill inadvertently adopts aftur his owners untimely demise. A rather fussy eater, yet amazingly astute kitty who appears to know things even before they happen. If mew love a murder mystery, mew'll love this series. 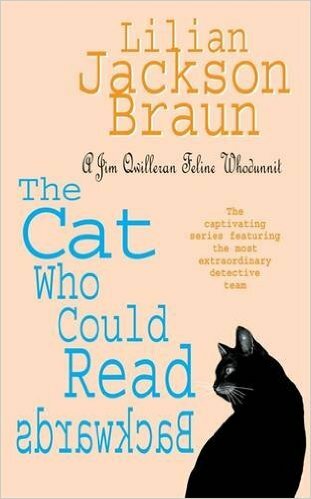 We were effur so sorry when the author died a few years ago as there'd be no more books, yet the good news is; there are 29 books in total so that's plenty to keep mew going fur a while, that's if mew haven't already stumbled upon this superb series. Very cute! Thanks for the share! Ooh, I'll have to read this one. I, too, enjoy "The Cat Who..." series! Love that bubble wrap suit. MOL! I have about 3 more books in this series to read. I stopped reading them so quickly because I didn't want them to stop. It sounds like a good read. My mum says she hasn't heard of those books before. I have read some of these books and enjoyed them, you have a great collection. The Cat Who books were the very first - but CERTAINLY NOT last - cat cozies Peep #1 ever read. She loved every single one. If there is a meezer in it, then we need to find them here to gift our petcretary! Cute bubble wrap suit...did you find a pink one yet?? MOL! You may have to put it on spawsial order.